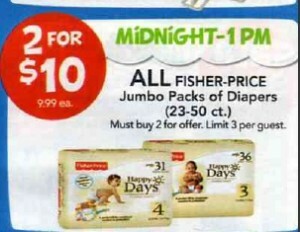 Toys R Us will be having a sale on Black Friday from midnight to 1pm on Fisher Price Diapers. Go HERE and print the $2.00 off per pack. The ad says you must buy 2 packs to qualify. You are currently browsing the archives for the black friday category.